Front Cover – The Best Exposure You Can Purchase for Your Equine Business! 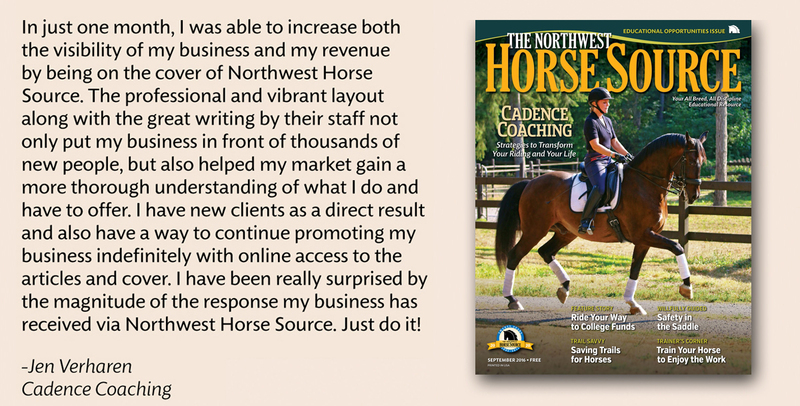 Imagine your business featured on the front cover of Northwest Horse Source, plus a full-page color article featuring your business inside the magazine. Not to mention that our online edition means your NWHS cover story is timeless and can be used as a reference for years to come. Your cover image will also be featured on our website home page and article archive main page. In print since 1995, we are the largest freely distributed equine publication in the Northwest. Over 16,500+ copies distributed monthly to a readership spanning WA, OR, ID, MT and CA. This is the best coverage in the region! Credibility, branding, exposure and a timeless advertising piece: We can help you set up a link to your cover story from your own website, letting the entire Northwest community know about your business or order gloss flyers with your cover on one side and your story on the other side for future promotional use. Timing is everything – don’t delay in reserving your spot! We only have 12 covers per year, so make sure we can include you in an upcoming issue. See cover availability HERE – Hurry! Covers sell quick! How Do I Purchase a Cover? NWHS Cover purchase requires a $500 non-refundable deposit to reserve your space plus a contracted minimum of three ¼-page ads in The Northwest Horse Source within one year of the scheduled cover. This provides the best exposure for your business, as repeated exposure has repeatedly been shown to raise advertising effectiveness. Exceptions to the three-time contract are special events and regular clients who have already run a minimum of six ads prior to NWHS cover purchase. To reserve your space call: 360-332-5579 and ask for Karen or email sales@nwhorsesource.com. The back cover rarely becomes available. If you missed an opening for this opportunity and would like to learn about other high-impact advertising options with NWHS, please call 360-332-5579 to learn more about digital display advertising and more!